Obsessive thoughts, just like the mighty 'Dib Dib', are unwelcome, incessant, distressing, and torturous, but they may not signify anything much at all. Of course, with the right plumbing the old woman’s leaky tap could be stopped and, surprisingly, so too can obsessive thoughts. So what are some of the more usual kinds of obsessive thoughts? 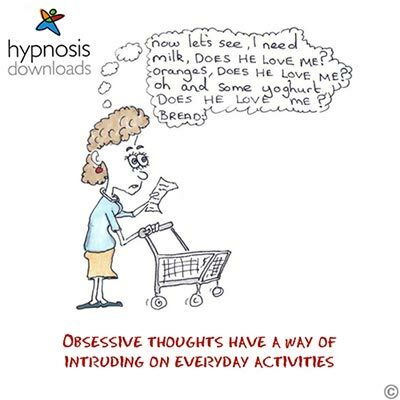 Obsessive thoughts breed compulsive actions. The mother who feels that unless she waves five times at her son as he goes to school something bad will happen to him, the anxious businessman who has to 'avert disaster' before boarding a plane by clearing his throat thirty times, or the young girl who can keep her parents safe by walking around her bed 50 times before sleeping. Obsessive thoughts often have this element of superstition about them. And what’s more, knowing that what you are thinking is irrational isn’t always enough to actually stop the obsessive thoughts from happening. Worst case scenario fantasies are common obsessive thinking fodder. “What if I just screamed in this formal meeting? What if I kicked this person's chair over! What if I do this…” The mistake people make is making the leap from “What if I do this” to “The fact I’m thinking about this must mean I really will do it” (1). Anybody with any kind of imagination will sometimes misuse it. Who hasn’t feared the wail of an ambulance might be on its way to attend to a loved one, or briefly wondered about leaping from the edge of a train platform? Not because they want to, but simply because they can imagine it. Worrying about the future is one focus for obsessive thoughts and so too is focussing on the past. What went wrong? How could it have been different? Did I cause this/not do enough? How could they have done this to me? Round and round. Obsessive thinking is exhausting. Having obsessive thoughts doesn’t make someone 'crazy', but it generally means they are over-stressed and, in turn, stress is worsened by the thoughts. If you’ve been obsessing, then follow these tips to help control and stop it. Just because I can imagine something doesn’t mean it’s more likely to have happened. I’ve never actually heard of anyone causing someone else a major accident and not being at all aware that they had. I’ve had this thought a thousand times and there’s never been any reality behind it! It doesn’t matter what your counter-thoughts are. The obsessive thinking has remained unchallenged for long enough. So stop letting it off the hook so easily. 2) Snap out of it! Obsessive thoughts plunge you into a kind of counter-productive trance. When we trance out, we focus down on specifics and lose awareness of other realities around us. There is an old behavioural technique whereby you wear an elastic band around your wrist, but it can be unobtrusive. Every time you catch yourself obsessing, force yourself to snap the elastic around the skin of your wrist. This can help you break the obsessive trance. It also conditions your mind to feel 'punished' every time it goes back to the same old, same old. Obsessive thinkers have a very powerful tool in their imaginations but, like the thief in the story, they’ll often assume what they imagine to be real is real. Just because you can think something or imagine it, doesn’t mean it’s more likely to happen. Sit down and close your eyes. Now imagine clapping your hands. Next, really clap your hands. Which was the real clap? Can you tell the difference? Of course you can. No one I’ve ever tried this with (no matter how obsessive and over-imaginative) has ever not been able to tell the difference between an imaginative clap and a real one. The imagination is a great tool, but it needs to be employed usefully and you can practice seeing it as markedly different from reality. Obsessive thoughts are really anxious feelings transposed into thoughts. What on Earth do I mean? Well, anxiety - like water - 'needs' a channel, something through which to flow. If you have 'free-floating' anxiety, then thoughts will have to be 'constructed' by your unconscious mind to provide a channel for those anxieties. So rather than trying to deal with 'what the thoughts mean', sometimes it’s best to stop the 'need' for them by lowering the stress level directly. Remember The Invisible Man TV show? He had to give himself 'shape' by wearing clothes (when he wanted to be seen). It’s the same with stress. When we’re stressed, we worry about all kinds of unlikely stuff and these worrisome thoughts merely 'give shape' to anxiety. Look at your life and seek to minimize any stresses you can. Take 20 minutes a day to relax deeply. You could listen to a relaxation CD or just do more of the stuff you enjoy. The fact is, when you calm down, physical stress no longer has to find obsessions to give itself shape and the obsessive thoughts can begin to disappear. Ever sat at a café and just 'watched the world go by'? You observe, but are not involved. People glide in and out of view and you remain detached and relaxed. There is an old meditation technique which encourages detachment from the contents of your own mind. 'Watching' obsessive thoughts in your mind from a relaxed 'distance' is very different from being in the middle of those thoughts and feeling totally identified with them. The more detached you become from the thoughts, the less you try to fight them. Just view them as curious nosey visitors into your house who’ll soon be gone if you leave them alone and don’t encourage them to stay. Breathe deeply and just observe what that thought does and what it tries to make you believe, perhaps by creating images. Just watch it curiously, like objectively observing a practiced liar that you can see right through. Don’t fight them; just observe. You can then imagine watching that thought starting to disappear, like a car travelling past you, coming into view, then continuing on its way and leaving you free of it. Or you can get a taste of this now by clicking on this free audio session. The old lady in the tale felt the Dib Dib was there to stay. It wasn’t. The thief believed the Dib Dib was a true life monster. It wasn’t. 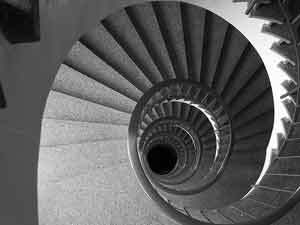 If you'd like some extra help around Overcome Obsessive Thoughts my company Uncommon Knowledge provides a huge library of hypnosis sessions through Hypnosis Downloads.com. I have helped create all the sessions there and have listed related downloads below. Please let me know in the comments section below how you get on. It's a good idea to voice your obsessive thoughts to a professional and well-trained therapist to help you develop more strategies to overcome obsessive ideas.